SolarCity is one of the largest installers of solar photovoltaic panels, with some 300,000 residential, commercial and industrial customers in 27 states. The proposed merger with SolarCity would vertically integrate Tesla forward, as opposed to backward, into the supply chain. That is, when people come to Tesla stores to buy a vehicle, they will be able to arrange installation of solar panels – and potentially home batteries – at the same time. Better battery design and lower cost make products like electric vehicles and, potentially, solar photovoltaic installations more economically feasible to a broader market. This approach worked for Ford more than 100 years ago. There is no reason to think it won’t work for Musk today. Lithium ion batteries made at the Gigafactory will go into Tesla’s vehicles, including the Model S and forthcoming Model 3, as well as Powerwall home batteries (on left). Tesla Motors. Maybe the best example would be home video recorders. When home recorders were first introduced in the 1970s, Sony sold them for US$1,300, which would be about $4,600 in today’s dollars. As the demand for home recording increased, and an industry standard emerged to consolidate demand on one format, scale accumulated and both design and cost innovations resulted in vastly improved functionality at prices well below $100 by the early 2000s. Another catalyst in this situation will be the increasing availability of “time of use“ rates for grid-sourced electricity. For years, utilities have instituted rate plans that charge more for usage during peak hours (typically midday) versus steeply discounted nonpeak (nighttime) rates. This allows consumers the option to shift demand to nonpeak hours or simply reduce peak consumption to lower their electricity bills. 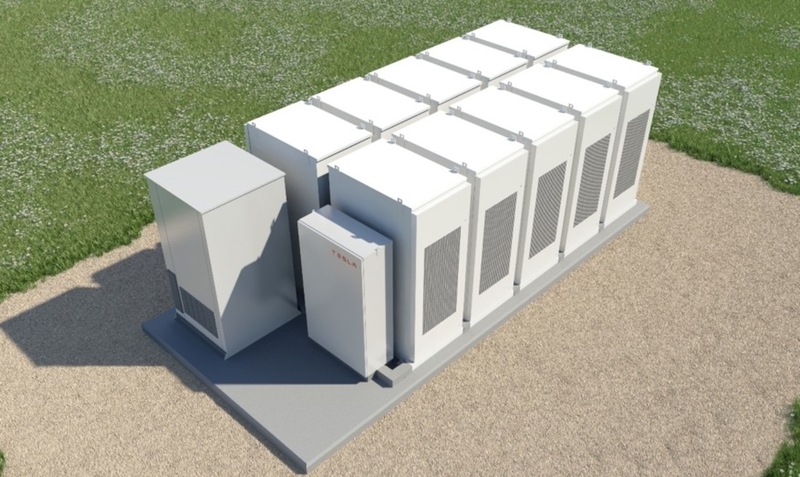 Tesla’s Powerpack is aimed at commercial customers, who pay typically pay higher power costs during peak hours and could be willing to pay for some backup energy. Tesla Motors. With time-of-use plans, Powerwall batteries can be used as a means to store grid power drawn during off-peak periods and use it to supplement peak-time consumption. For example, a Powerwall system capable of storing 10 kilowatt-hours (kWh) of electricity costs about US$3,500. By my calculations, using $0.25 per kWh off-peak rates to charge a battery and then using it to supplement $0.34 kWh peak rates would save 3,650 kWh of peak demand rates. That translates into saving $324 per year or a 9 percent return on investment on the system. Powerwall batteries can also be used as back-up in case of disruptions to the power grid. But pairing a Powerwall with a solar panel installation could be where the biggest advantages can be found. The typical U.S. household uses about 1,000 kWh per month. A homeowner can have a five kilowatt solar system installed for about $10,000 (after tax credits) and depending on the climate, generate most of their monthly grid needs. With many climates in the U.S. getting between four to seven hours of sun per day, a five kilowatt solar system could generate as much as 1,000 kWh per month. By adding a 10 kWh Powerwall, the user can store excess solar generated power or nonpeak grid-sourced power and use it when most advantageous. Starting the peak period every day with a fully topped-off Powerwall could save, by my estimate, as much as 3,650 kWh of peak usage per year. Added to the solar energy generated and used immediately, many users could avoid peak demand use from the grid altogether – at least on sunny days. This, depending on local rates and climate, could easily generate a return of 20 percent or higher. If you can extrapolate from Henry Ford, calculators, personal computers and even VCRs, you would also say this is very likely. As battery design improves and cost falls, the Powerwall battery should become more attractive economically and the the forthcoming Tesla Model 3 electric car should be affordable for an ever wider demographic. I signed up for a Model 3, along with about 400,000 other people. W. Rocky Newman, Professor of Management, Farmer School of Business, Miami University. This article was originally published on The Conversation. Read the original article.